(OCIE) District Office’s Lender Forum hosted by the Orange County / Inland Empire Regional SBDC and held at the Santa Ana DoubleTree by Hilton on August 7, 2017. In attendance were more than 120 members of the local lending community, SBA’s funded resource partners, and SBA leadership. The event was attended by Mike Vallante, Regional Administrator for SBA Region IX; Philip Lovas, Region IXSmallBusiness Advocate from SBA’s Office of Advocacy; Victor Parker, District Director of SBA’s Los Angeles District Office; and former SBA Administrator Hector Barreto. Welcoming remarks were given by Deputy District Director Rachel Baranick, Mike Daniel, Director OCIE SBDC Network, and Kurt Chilcott, CEO/President of CDC Small Business Finance. The keynote presentation was delivered by William Manger, who serves as the SBA’s Associate Administrator of the Office of Capital Access. His responsibilities include the agency’s loan program policy, technology, operations and oversight. rewriting SOP’s to streamline the process of its loan programs, and creating policy initiatives to make it as easy as possible for lenders to make loans to the small business community. Filling gaps in the credit market for those unable to access traditional loan programs, using advances in the latest technology, and implementing best practices throughout the agency will help fulfill Manger’s vision to create jobs for American workers and grow the economy, not bureaucracy. The two newest additions to the Orange County / Inland Empire SBA Lending community were welcomed at the event. Blue Gate Bank, a new community bank in Orange County serving clients primarily in the professional services, healthcare, manufacturing, HOA, insurance and property management sectors, recently became an SBA lender which is headquartered in the district. Lendistry, which is in the financial technology industry (fintech) has been approved to make Community Advantage loans. This Southern California online small business lender is able to leverage state and federal loan guarantee programs with its CDFI and SBA designations increasing the access small businesses have to funding, particularly those in historically underserved communities. TOP COACHELLA VALLEY COMMUNITY LENDER OF THE YEAR 2017 – RABOBANK, N.A. SBA lending in the Orange County / Inland Empire District is up 15% year over year in dollar amount versus the rest of the country which is up more than 8%. The OCIE District is also up 33% in loans to woman-owned small businesses. As mentioned during the forum, the OCIE District ranks 4th in dollar amount across 68 district offices nationwide. For more information about the Lender Forum, please contact Rachel Baranick, Deputy District Director at (714) 560-7441 or email Rachel.baranick@sba.gov. The U.S. Small Business Administration (SBA) was created in 1953 and since January 13, 2012, has served as a Cabinet-level agency of the federal government to aid, counsel, assist and protect the interests of small business concerns, to preserve free competitive enterprise and to maintain and strengthen the overall economy of our nation. 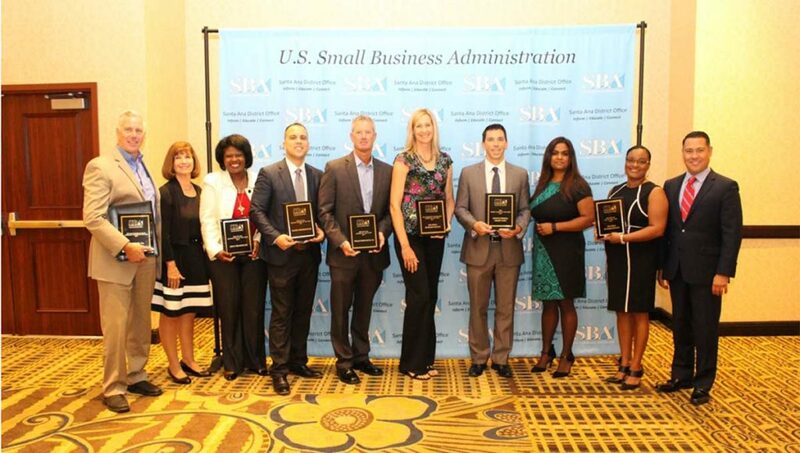 The SBA helps Americans start, build and grow businesses. Through an extensive network of field offices and partnerships with public and private organizations, the SBA delivers its services to people throughout the United States, Puerto Rico, the U.S. Virgin Islands and Guam. The Orange County/Inland Empire District Office, under the leadership and vision of J. Adalberto Quijada, District Director, is responsible for the delivery of SBA programs and services in the Southern California counties of Orange, Riverside, and San Bernardino. Located in Santa Ana near John Wayne Airport, the office and its staff of 14 facilitate understanding and access to SBA loan programs; coordinate and conduct hundreds of training sessions and special events annually such as matchmaking forums, loan fairs, and business plan competitions; and manage a portfolio of approximately 104 businesses enrolled in the agency’s 8(a) business development program.